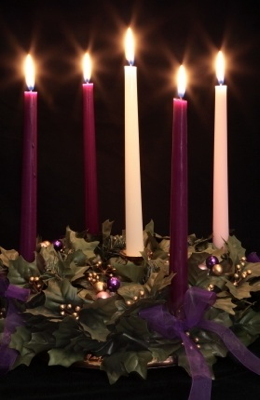 Welcome to the first week of Advent! Advent is a time of preparation, when we wait and prepare for the Christ child. Each week you will light a new candle as we recognize the things that Christ brings to this world: hope, love, joy, and peace. Advent is a time of waiting and anticipation, for at the end of Advent we celebrate Christmas and the Christ child. For children, the waiting feels like an eternity. Each devotion during this Advent season explores what each group was waiting for: the prophets were waiting for something they’d never see (the Messiah). Mary and Joseph were waiting for a baby and the change in their lives that would bring. The shepherds were waiting for daylight. The angels waited thousands and thousands of years to be able to announce the coming of the Messiah. And finally Christ, who waited to come into the world to save it. The prophets waited with hope that someday the Messiah would come. These days, children wait with hope that someday they will get to drive, someday they will go to college, someday they will get to stay up as late as they want. Whereas most of the prophets never got to see their hopes realized in the Messiah, most children will eventually be able to drive, go to college, and stay up as late as they want. But for now, it feels like those things will never arrive. As they wait with expectation for these things and for Christmas, remind them that the prophets waited a long, long time for the Messiah to arrive. But eventually, their hopes and dreams came true in the form of Jesus. As a family, talk about how it feels to wait for things that seem so far away. Thank God that the prophets never gave up, that they continued to tell people that the Messiah was coming. Ask God for help in pressing on when it seems like what we wait for will never happen.